MAN WITH A (PSYCHO) PLAN Rockwell tries to convince Walken and Farrell he knows what he’s doing kidnapping a gangster’s beloved pooch. Seven Psychopaths isn’t an easy movie to describe. The title says “horror flick”; the marketing says “Pulp Fiction knockoff.” Neither is accurate. If you try to pitch the movie to a friend, you may find yourself saying things like “Tom Waits carries a white rabbit wherever he goes, because he adopted it when he and the love of his life murdered the Zodiac Killer. He’s a psychopath, see, but a good psychopath.” It’s not unlike trying to convey the essence of an encounter with the fabled Men in Black. This is actually an encounter with Irish playwright Martin McDonagh — who, as anyone who saw Saints & Poets Production Company’s The Pillowman last fall can attest, has a brilliantly twisted mind. 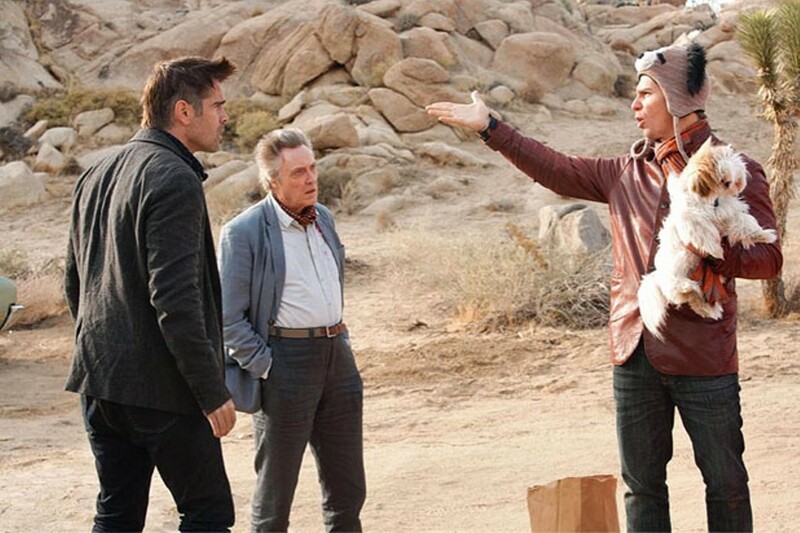 Seven Psychopaths is the first feature McDonagh has written and directed since the black comedy In Bruges (2008). Loosely structured and self-indulgent, but still highly entertaining, it finds him going in a Charlie Kaufman direction while pirating ideas from some of his own theatrical works, including The Pillowman and The Lieutenant of Inishmore. As in the former play, the protagonist is a writer and obvious authorial stand-in (Colin Farrell as Marty) who spins stories within the story. As in the latter, the antagonist is a psychopathic gangster (Woody Harrelson as Charlie) with an incongruously tender attachment to his pet. What brings them together is Billy (Sam Rockwell), who is Marty’s best friend and, for all intents and purposes, his id. While Marty, a hard-drinking Hollywood screenwriter, frets about scripting yet another hyperviolent movie that glorifies psychopaths and their antics (yes, his project is called Seven Psychopaths), Billy goes out and finds real madmen to inspire him. Marty ponders the cinematic potential of peaceful psychopaths — Quaker or Buddhist ones, say — even as his loose-cannon friend puts him on a collision course with the other kind. An actor with a tendency to punch directors during auditions, Billy has a side job: kidnapping pampered pet dogs for the reward money, under the supervision of genteel, ascoted career criminal Hans (Christopher Walken). When Billy abducts Charlie’s beloved shih tzu, all three men find themselves squarely in harm’s way. If this sounds like a shaggy-shih-tzu story rather than a tightly plotted thriller, it is — and that’s part of the joke. Billy and Marty are one-note characters, petulant boys playing at grown-up violence. But their arguments about how to end the movie within a movie — bloody shoot-out? quiet epiphany? both? — obviously mirror the author’s internal debates. Indeed, they do. For decades, we’ve made fictional psychos of one kind or another into folk heroes: Norman Bates, Freddy, Jason, Tony Montana, Hannibal Lecter, Dexter Morgan. By inventing righteous killers who only hunt other killers (like Dexter or Waits’ character), we can even have our sociopathic cake and eat it, too. McDonagh doesn’t explain where pop culture’s boundless appetite for colorful crazies comes from, or what it has to do, if anything, with our feelings about genuine mental illness. But he does chase it back to the gleeful pleasure of spinning tall tales just for the hell of it. In the process, he spins a pretty good one himself, even if anyone who tries to recap it will find him- or herself not making a lick of sense.